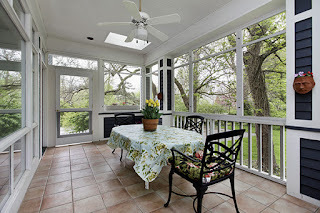 This time of year when the weather is superb but the sun is getting stronger and the flying insect population is increasing, I want a screened porch. Several of my neighbors have them and I am envious. When I was a child my family lived in one of those post World War 2 tract houses that had a screened porch on the end. I loved that porch and the way the door to the outside slammed. I really remember that the sound of that door slamming, wood against wood. Anyway, when my younger siblings were born, Dad renovated the porch and turned it into a bedroom for me. It was no longer a screened porch but it did have great windows, which I also love. When some of my neighbors were having their decks converted into screened porches, I wanted to do it, too, but my husband (never an outdoor guy) couldn’t see the value and was concerned that it would make the family room dark since it would diminish the light entering through two of the windows. But this time of year, every year, I think about it again. I’d love a screened porch. 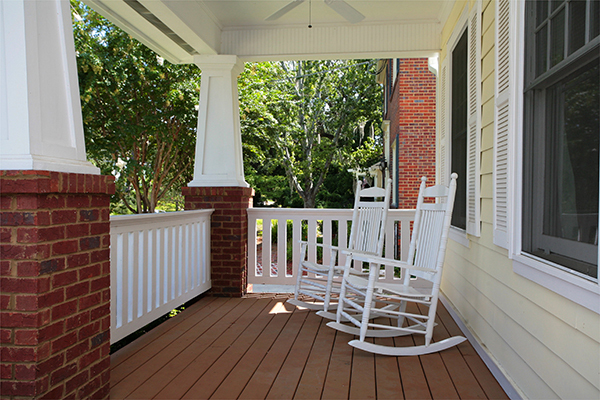 In the world of porches, most of us have front porches of some sort, back porches (called stoops in some areas), or decks (which are definitely a version of porch). I have a morning room with lots of windows but I don’t consider it in the realm of porches because even though I can get an outdoorsy effect by opening all the windows, it isn’t separate from the rest of the house and would impact anyone preferring air conditioning. What about you? Do you have a porch? A cement porch? A screened porch? Or just a porch that provides access to a door? 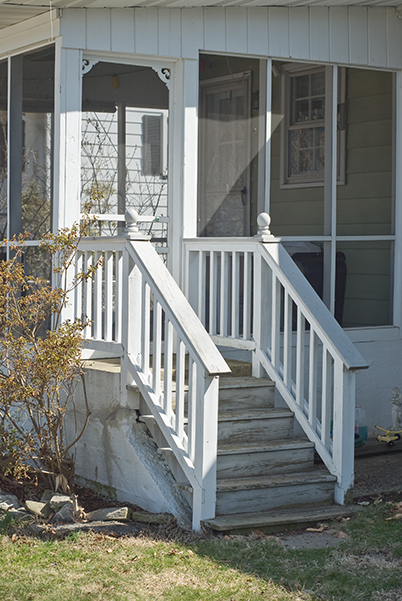 Are porches out of fashion? Or coming back into fashion? We have an old farmhouse with a beautiful front porch AND a screened back porch that's currently being renovated. It sounds WONDERFUL! Two real porches ~ I'd love that. We have a screened porch in the back of the house that we added a few years ago. We love it! A few years ago, we had a neighbor who added screen porches onto some our neighbors' houses as a moonlighting job. By the time I decided to have it done, he had decided to call it quits. He did really nice work but his family was missing him, so I could hardly blame him. Anyway, I could've looked into having someone else do the job, but didn't. In the house I grew up in we had a screened in porch in the spring, summer and part of the fall if the weather was night and then for winter we put in the glass windows partitions. I spent a lot of time out there with my grandmother. Wonderful memories. 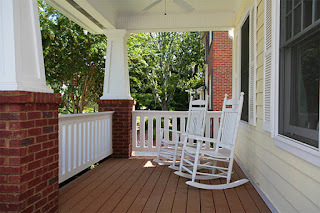 How I remember my grandmother's screened porch! She had green wicker furniture ~ a chair, a round table and a swing. She rarely used the porch, but I loved it.